Very nice quality and craftsmanship. This rug adds a nice naturals feel to the room. The only con is that it puts out a lot of dirt. Sweeping and mopping is a chore however I have purchased three different sizes due to their attractiveness. Promoting a tranquil ambiance, Safavieh's handwoven pure jute rug has been expertly crafted for those looking to add a carefree vibe to their home. Featuring accent colors of light and dark beige, this neutral-colored rug will blend effortlessly with new or existing decor. Featuring a plain weave design, this rug is richly textured with a chunky natural vegetable fiber resembling wool. I love the color, exture, and overall look of this rug...BUT after five months of use this rug continued to shed so much sand and dirt, I finally rolled it up and put it aside until I can find a use for it outside. I even power washed this rug, hoping that would resolve the problem...sadly it did not. I am greatly disappointed! Love this rug. Only a few things to note although I would definitely buy it again....1) has a bit of a smell when you get it but all jute rugs do; 2) rug is pretty tall - this can cause a clearance issue with nearby doors; and 3) this rug has put out a fair amount of sand on the floor for the first month - maybe they sandblast it to make it soft??). This is a super soft, nice rug. We enjoy immensely. 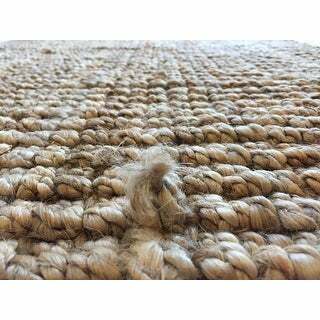 I bought two of the natural fiber chunky jute rugs for our lake house cottage. The rugs are nice quality and add a coastal/farmhouse vibe. 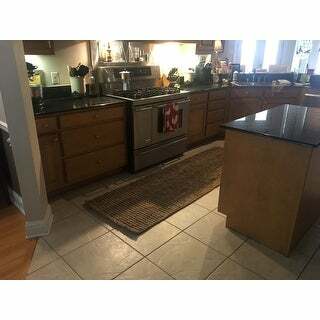 The runner rug I ordered for our galley kitchen ended up looking a little too narrow (measurements were accurate), so I will be exchanging for a larger size. This rug is a bit thicker than the display picture, but I love the pile height, my hallway doors clear it. It is a thick, rich weave and although it looks rough, it is actually very soft on bare feet. Feels great. Blends fantastic on our hard wood floors. 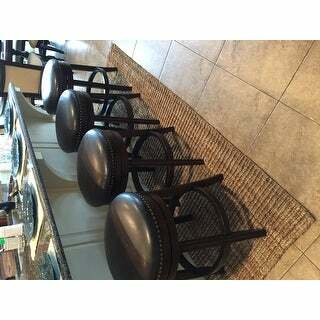 We love the monochromatic color blend for a beach style, elegant look. I highly recommend this product. It is an excellent value! 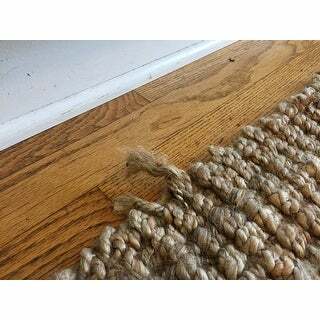 I received the Safavieh Natural Fiber Chunky Jute Runner Rug last week as ordered. The delivery was excellent as is this product. I like the natural look of the rug. It's thick and of good quality. Love this rug. Very durable. Good neutral color. Love the natural look and feel of this rug on our semi-dark wood-like, tile floor in our bedroom. It's a tropical decor and I put this runner near the foot of the bed to break up large space between the bed and the mirrored wardrobe. It pops when you walk in the room and gives it a warm and natural feel. I have the same rug for our entry (3x5) and for our dining table area (6x9) and they are wonderful. The only thing is that when you first unroll them, and walk on them, there's a very fine dust/dirt that comes from the fibers, so I suggest unrolling it outside, then walk on it or try to shake it before putting it in the house. Otherwise, just vacuum once it's layed down. Great rugs...easy to spot clean, easy to rinse if there's an accident. And I think I will get a lot of wear out of them. 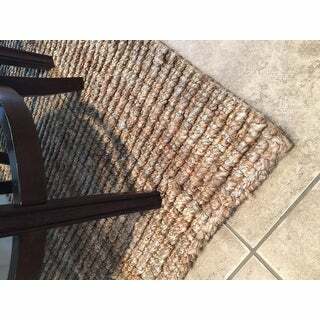 Great, sturdy, durable natural fiber runner/rug. While it is a bit "chunky", it is protective of the carpeted floor that it sits on in our home. It stands up to heavy traffic nicely, and serves this purpose well for us. The natural color blends well with most decor, but honestly, is a bit more casual than formal. I would recommend this runner and plan to purchase another in the near future. Love this rug! Feels great on the soles of my feet, like a mini massage. I diliberately slow down when walking over it to enjoy the great texture on my barefeet:). Only down side is that it is thick, so I am unable to clear it with opening/closing the door (in my hallway). I am pleased with the rug and pleased with the pad I ordered to put under it. It had a very faint odor when opened, but was gone with a day or two. Soft, cushy and perfect for my hall entry way. I did such a good job of showing it off that my friend ordered one also. Thick, chunky rug. Exactly what I was looking for. Would highly recommend. It's a great looking jute runner. This is my 2nd. I love the look and feel. It definitely needs a pad. It has strong texture. I feel as if it massages my feet. My son complains and says it hurts. Sadly too good to be true! Pretty rug but unfortunately you get what you pay for! Within one week of purchase our runner has started to fray and untie. Definitely would not recommend this purchase unless in a 100% no-traffic area. I love these rugs. Bought two runners and one rectangular one for our foyer. We've had them for a couple years and they've held up fairly well with heavy traffic that includes a large dog and toddler. Yes, they shed and they haven't stopped shedding, but it's to be expected with jute. Some snags from our dog, but I just pull them through and it's fine. I found this to be too thick for a runner. I gave it away. Love this rug. Great chunky sweater like texture but not too rough on the feet. I also bought the smaller size for another doorway and it also looks great. Thick durable and nice looking.great spot to drop shoes right inside the back door. Love this rug! We have one outside on our front porch, and we have one inside the front door, as well! We have also used them in the kitchen. It was exactly as described. The measurement was exact and the weave is straight. Many straw rugs I have ordered are all misshaped. This one was perfect. I bought the runner to go with the larger rug. Love these rugs. Thick and comfy to walk on and they catch a lot of dirt etc that our dogs tend to bring in. Would buy these over and over again. Very satisfied. Rugs made from natural fiber jute, sisal and seagrass have a wonderful woven texture that allows dirt to fall through. Vacuuming the rug, and underneath the rug, is the easiest way to remove debris. In the case of a stain, natural fiber rugs can be scrubbed with a soft brush, but avoid getting these rugs too wet, as water can weaken the fibers over time. "Can this be installed on stairs? " "Could this rug work outside by pool?" It could be used outside. I have two of these rugs, one in a utility room and one in a closet. I love them. Any product of jute/bamboo can withstand outside. I just never thought of it like that. I have toyed with getting a large version of this for my dining room. Does that tell you how much I like the rug? Yes, I think you could use outside.I love it in my kitchen.But outside would be great also. Hope this helps. "Can this rug be machine washed?" Hello WildlifeRN, this rug is not machine washable. We recommend hand washing. Thank you for shopping with us. "I ordered a different rug that has fringe on the edges...but it didn't show the fringe in the picture. Can someone please confirm that this rug does not have fringe on the edges?" Hello nikki0877, this rug does have a fringeless border. Please let us know if you have additional questions. Thanks for shopping with us. "How can I find out the weight of this item? I asked customer support and they couldn't tell me - very surprising." Hello holdenmt, the shipping weight of the Safavieh Hand-woven Weaves Natural-colored Fine Sisal Runner (2'6 x 8') is approximately 9 pounds. Have a great day. Price and overall look, I like how it appears to have highs and lows of the natural color. needed a runner in natural fibers, liked the clean edge & of course good deal!